Bangladesh’s Foreign Minister AH Mahmood Ali has expressed hope that the first batch of eight thousand Rohingya people would be able to return to their original villages in Rakhine State of Myanmar soon. Nine Myanmar nationals were burned to death and six others injured after their van hit a roadside tree and burst into flames in Kamphaeng Phet province on Sunday. State Counsellor Office Director-General Zaw Htay said that the President had given a directive to Yangon Region government regarding the prosecution of Eleven Media journalists. Are “genocide gems” the new blood diamonds? Activists are campaigning against Bulgari’s sale of the jewels, saying they help fund Myanmar’s military. Myanmar’s “Buddhist Bin Laden” has made a return to public life, appearing at a rally in support of the military generals condemned globally for a brutal crackdown on the Muslim minority Rohingya. A persecution watchdog group has said that it’s profoundly concerned about the ongoing removal of priests, nuns, and Christian teachers in Myanmar’s northern Shan State. Six Rohingya were killed early Friday (Oct 19) after a blaze tore through an overcrowded camp for the persecuted minority in Myanmar’s Rakhine state, the local fire service said. Nearly 130,000 Rohingya have been living in squalid refugee camps in Myanmar’s Rakhine State since 2012. 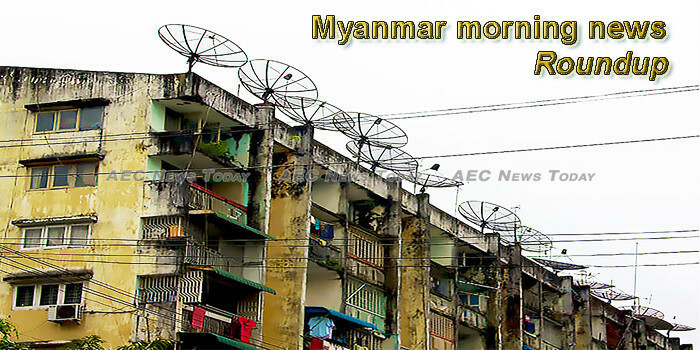 Low pressure over Myanmar will create downpours and possible flash floods in 19 provinces, the Meteorological Department warned on Sunday. The U.S. law known as the Magnitsky Act has been wielded against Russian officials and the Myanmar military, proposed as a tool to punish China and Saudi Arabia and invoked in the ongoing investigation of Russian interference in the 2016 U.S. presidential election. The chair of a United Nations inquiry that accused Myanmar’s military of genocide is likely to brief the Security Council this month after Britain, France, the United States and six other members requested the meeting, diplomats said on Tuesday. A DRAMATIC encounter between police and a brazen pirate gang on the Twante Canal has left two men dead and another missing, believed drowned, and highlighted challenges faced by an understaffed Myanmar Police Force to maintain law and order. Buddha statues inside the Lemyethna Temple in Mrauk U, Rakhine State have been vandalized on Wednesday night. Myanmar State Counsellor Aung San Suu Kyi visited Myitkyina in Kachin State yesterday and visited a boarding school for students, a drug rehabilitation center donated by the Daw Khin Kyi Foundation, and IDP camps in the area, according to a local media report. A statue of the hero diver will be installed at the Ban Nong Khu community and will be consecrated by a highly-respected Buddhist monk from Myanmar after the end of Buddhist Lent. Myanmar State Counselor Aung San Suu Kyi has stressed the important role of the Union Enterprise for Humanitarian Assistance, Resettlement and Development (UEHRD) in conflict-hit Rakhine state for achieving sustainable peace and stability in the state, Myanmar News Agency reported Friday. Burgener visited Myanmar from October 10 to 20—her third visit to the country as the SESG, reports UNB. Hindu refugees from Myanmar living in a camp in Bangladesh have been celebrating the festival of Durga Puja for the first time since fleeing violence in northern Rakhine state last year. From a beachside perch next to a group of sunburned Japanese surfers, betelnut seller Let Let Khine studies a reedy figure being swallowed by a meter-high swell. Three senior journalists at Myanmar’s largest private newspaper were remanded in custody after handing themselves in to police on Wednesday, facing accusations of causing “fear or alarm” following a complaint from the Yangon regional government.